This Osprey book looks at the Mexican and Texan armies which fought until the capture of Santa Anna. While the Mexican army organized under Santa Anna's dictatorship appeared to be well-equipped and well-organized, in practice the troops were ill-served, thanks to corruption and poor management. On the other hand, the Texan army was not simply a rabble... the Texans were already working hard to equip a standing army and they had help from U.S. volunteers, including deserters from the U.S. Army. Some volunteer companies arrived in Texas in uniforms which were at least comparable to those the Mexicans were supposed to have, while others were dressed in more practical outfits. Still, Santa Ana's army had a wealth of experience and the Texans had little. It was truly a "David and Goliath" war. The artwork and interpretation are first-rate. 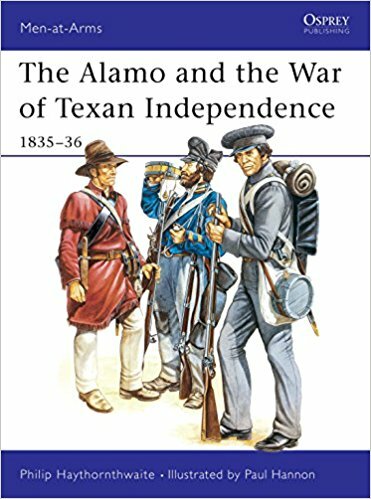 This book provides an excellent insight into a war that is little known to the public, with exception of the Alamo, a hard-fought and doomed battle that inspired TWO nations.